This echo ultrasound also offers complete cardiovascular functionality and comprehensive cardiac measurement and analysis. With its laptop size, physicians and users can easily carry the GE Vivid e ultrasound with them, and with high-quality imaging quality and user-friendly, auto image optimization. Furthermore, the system’s 40GB internal hard drive makes storing and transferring images quite simple. The connectivity options include wireless DICOM, DVD, USB, VCR, printers and MPEGvue. 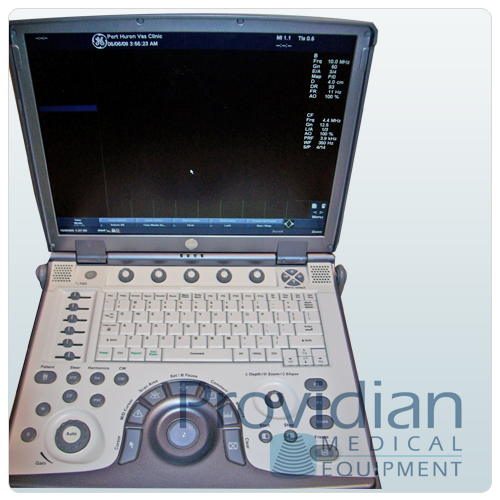 For the price and features, the Vivid e is arguably the best priced portable cardiovascular ultrasound machines. It has versatility to perform a wide variety of applications. While it’s not the level of quality that is found on the GE Vivid i, it is the best choice for those with a smaller budget. Many mobile companies and small offices are pleased with the quality of the Vivid e for the low price.